Review of "What To Do About Mama? : A Guide To Caring for Aging Family Members"
The authors, Barbara G. Matthews and Barbara Tranin Blank, have presented a comprehensive work that will benefit every person who is in the position of being a caregiver. The authors provide key information for all caregivers in every situation that can occur. Their work discusses the caregivers’ various responsibilities, the care receivers’ different reactions to their care, the wide support that hospice gives beyond moribund preparation, and the challenges posed by family members not providing the care. There are caregivers’ different narratives that clearly illustrate the situations that any caregiver will face. These narratives provide solid advice in a personal style that will maintain the reader’s interest. An especially effective method is the personal sharing by each author. They have very different experiences, one providing within her home and one providing care from a distance. Their narratives that are interspersed throughout the work add to the authenticity of the work. Although personal, both authors do their best to maintain objectivity; they do not present information in a cold manner or overly subjective manner. Their sharing of personal experiences is quite effective. Since this reviewer has been a caregiver with three family members, I know these authors’ experiences and the sharing by different individuals are very real. And the information they give will benefit every person who is a caregiver or a care receiver. The culmination of the book is the chapter that provides clear recommendations for every caregiver. This chapter alone is well worth the purchase of the work. 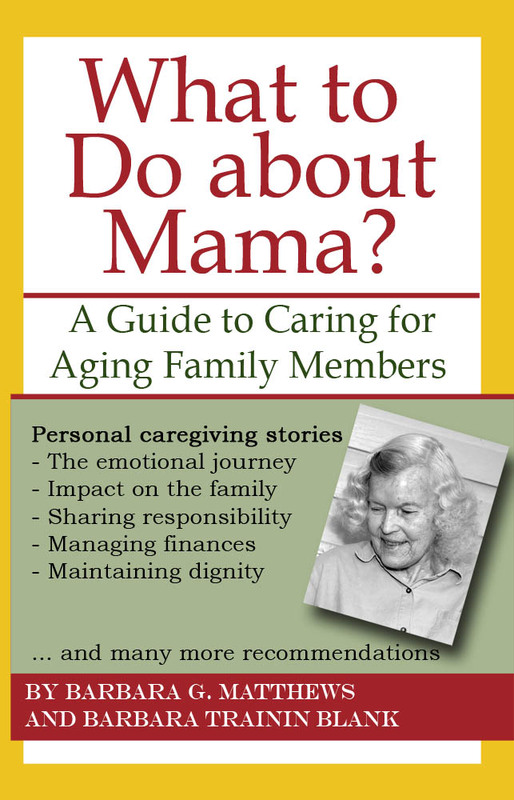 And as one who has been a caregiver, What To Do About Mama I know that this book is a must-read for every individual who wants to be a prepared and effective caregiver and a cooperative and more understanding care receiver. This entry was posted in book reviews and tagged barbara matthews, barbara trainin blank, elder care, eldercare, elderly parents, end of life, hospice, the barbs. Bookmark the permalink.